As a vegan small business, we love nothing more than supporting other small businesses bringing vegan goodness to the world. In this series, we highlight our favorite vegan small business by sharing our experiences with their products. Rest assured that we only feature brands and businesses that we absolutely love. If you'd like us to highlight your vegan business, please contact us. The concept behind Shangri-La Vegan Restaurant is one we can get behind: simple, organic, macrobiotic food. It's the kind of food that we want to cook for ourselves at home every day: wholesome, delicious, uncomplicated. 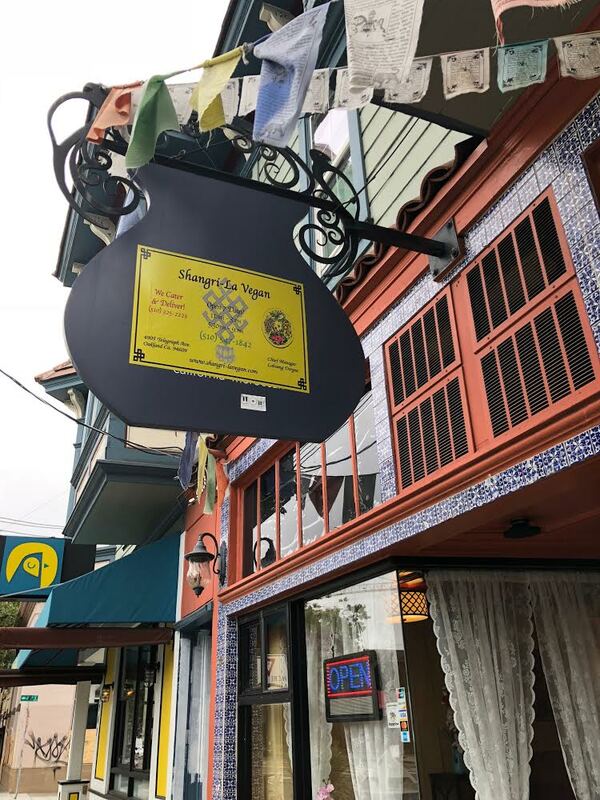 Unassuming and located in the hopping Temescal district of Oakland, Shangri-La offers a lunch and dinner service every day. They offer a set menu, serving up just one option as a main meal in either a moderate or full portion. They also offer a simple meal that has no seasoning at all. We've only tried the main meal and we can promise that it is DELICIOUS. When you enter the restaurant, you can seat yourself. Then, you help yourself to water and hot tea. The 'twig tea' might not sound very appetizing, but it is really good. They also have kombucha and beer/wine available. The waiter will then ask you if you'd like a moderate or full portion. Moderate is $10.95 and Full is $12.95. Upon your decision, your soup will be out in a moment. Dinner follows when you finish your soup. It typically consists of a bean, a grain, a vegetable medley, and both steamed and fresh greens. It doesn't get much healthier than this, friends. What we love most about this restaurant is that the food is just packed with delicious flavor. It is so well-seasoned. All too often, eating out, even as a vegan, means that you're eating food with a lower nutritional profile than you'd prefer to eat. We love that Shangri-La solves this conundrum by providing delicious, nutritionally dense food. The vibe of the restaurant is peaceful, friendly and a bit quiet. The service is invariably friendly and welcoming. The model is a bit different than your typical restaurant, but they are patient with you as you figure it out. Please support this amazing restaurant if you ever find yourself in Oakland. Do you have any recommendations for other vegan businesses we can feature? Let us know in the comments!